Layer to slice routing is a very powerful tool. It allows you to create complex setups very easily. It also has significant drawbacks, so use it with caution. 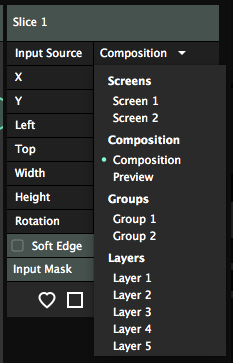 Every individual layer of a Resolume composition is also available as an input for slices. By default, slices take the complete Resolume composition as input. You can assign which input is used for a slice on the Input Source dropdown on the right hand side of the Input Selection stage. After you have selected a layer as a direct input, you can warp and transform this layer directly, completely separate from the composition. This is for instance very useful when you want to display different content on 6 HD displays. In this case, you can use layer to slice routing to keep your composition size down. You can keep your comp size at 1920×1080, and play each layer in its own slice. This way you don't have to render a huge video containing your 6 videos in one. This is very efficient and doesn't place too much stress on your computer and graphic card. You can choose to bypass both the the layer's opacity and its Solo and Bypass toggles. This is useful if you want to see the layer only in this slice. Simply toggle off the Input Bypass/Solo switch, and then bypass the layer in the composition. The layer will no longer render in the comp, but it will stay visible in your slice. On Arena you can also create groups. Just like layers, groups can also be routed to a slice. You will have the same options to ignore the Opacity and Bypass/Solo. This is useful to get the Preview output in a separate external display. This is some serious slice-ception over here. You can route the output of a Virtual Screen to a slice in another screen. This way, you can add more phases to the warping process. For instance, you can edge blend two physical outputs using the regular blending process. Then, you can let each of these two blended slices take its input from a virtual screen. In this virtual screen you can then warp and map your content to physical objects, without having to worry about the overall blend. There's a few other useful scenarios, most of them get too complex to explain in a single paragraph in a manual that no one reads. "When you have a hammer, not everything is a nail." Keep in mind that by routing a layer to a slice, you actively decide to bypass the composition completely. When a layer is routed to a slice, all layer and clip effects will still be applied, but blend modes and composition effects will not! The slice will simply render all content with straight alpha on top of the other slices. Layer to slice routing can let you make setups very quickly, but you can also very quickly paint yourself into a corner. It's best used to display layers of content on separate screens, when you are sure you never want to mix them. Don't use it as a quick way to position content! Let me repeat that, because I don't think you heard me. Don't. Use it. As a quick way. To position content! You will not be a happy camper. If that's what you want to do, use the Slice Transform effect instead. We have a whole chapter in this manual dedicated on how you can create an input map for a complex stage design.